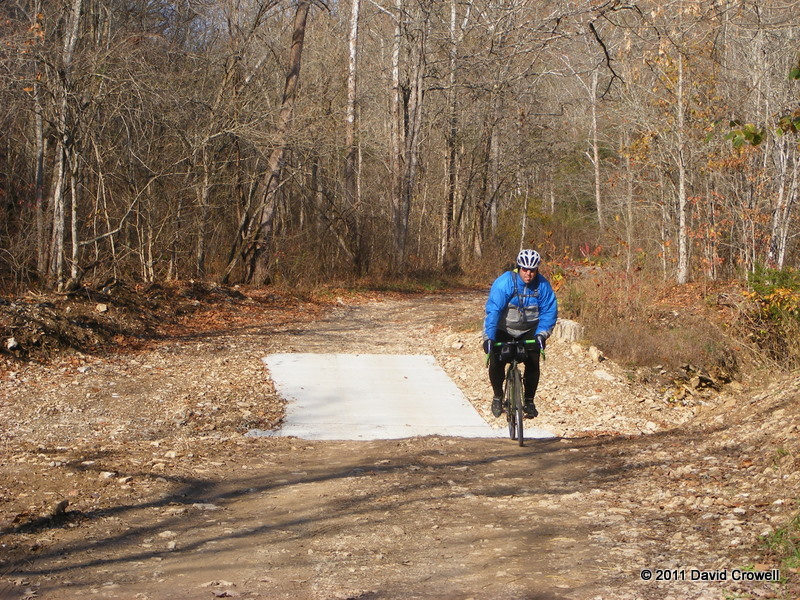 Tim cooked up an awesome route to train for the upcoming Gravel Grovel without having to drive too far. We discussed with Timothy and Patrick. Both were interested, but Patrick couldn’t dedicate that much time. It’s a good thing he didn’t try to “squeeze it in”, we were out for many hours. I got up early and cooked eggs. I wanted a substantial breakfast before a ride like this. I should have had more carbs. This became important later. I had also planned to grab some snack food at the local gas station to carry with me, but the station was closed. I drove Tim and I out to pick up Timothy, or so we thought. We met Timothy as Heine Brothers Coffee where we each had a cup and a scone. I grabbed another scone for during the ride. We thought Timothy needed a ride, but instead he followed us. This is the last drive in my truck. I’ll have more about that in another post. Okay, so the Timothy transportation snafu was just a communication error. That’s what happens when all of our planning is done via email. The ride started in New Castle KY in Henry County, northeast of Louisville. It’s just far enough away to be quite rural. We were on the road before 9:00am. It was cold, probably just a bit above freezing. We headed north east. Tim let me know that his GPS was not working as expected, so he told me to navigate. I had loaded the route on my GPS as a track the night before. I wasn’t feeling strong. I was cold. I fell behind. 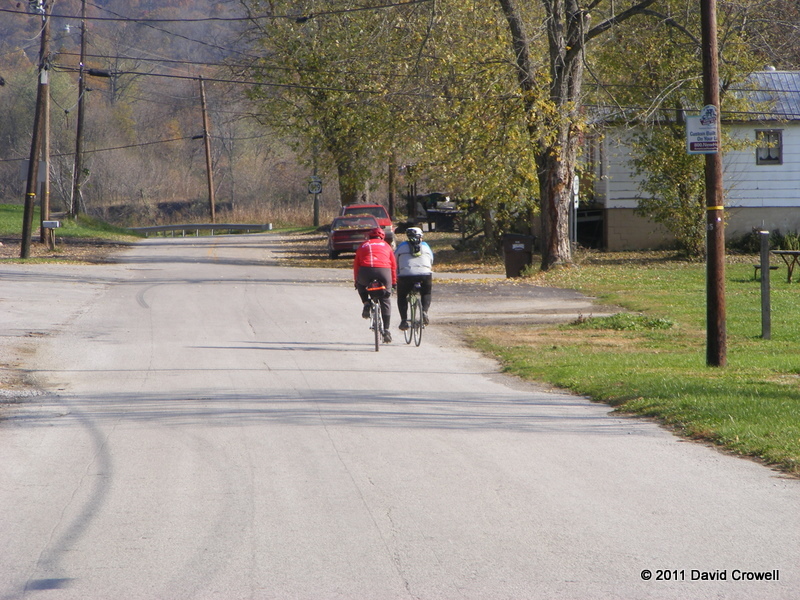 Tim and Timothy were riding ahead of me, far enough that they couldn’t hear me yell at them when they missed a turn. We were less than a mile into the ride. Not a great start. I have chase and eventually got their attention. 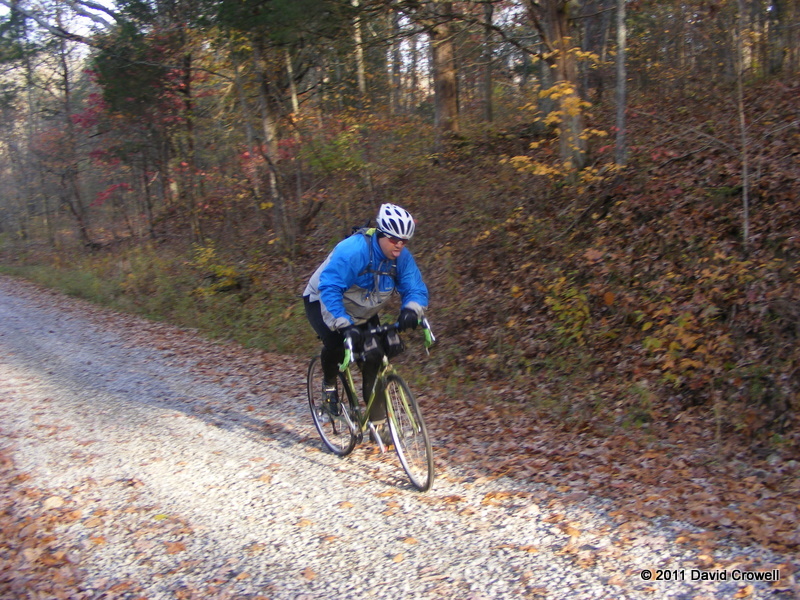 We all turned around and went back to our turn on Flat Rock Rd, our first gravel of the day. Did I mention it was cold? 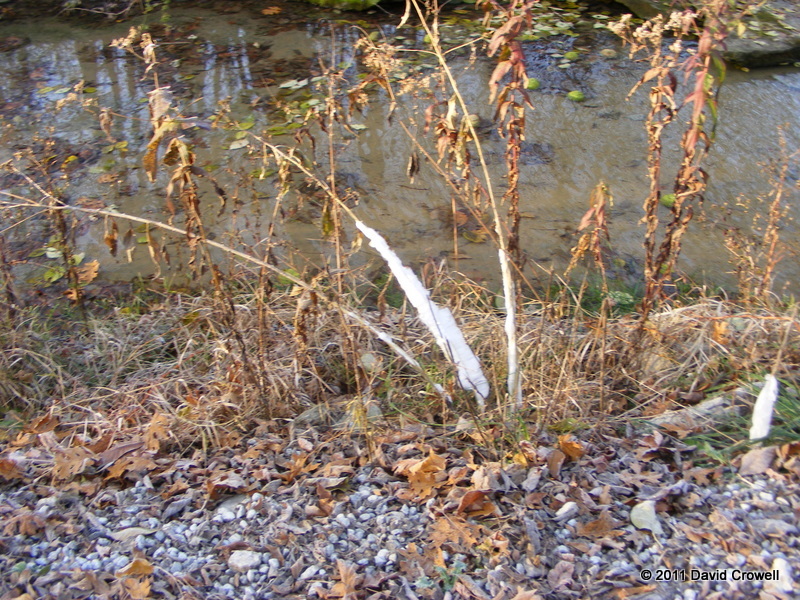 Tim said these were “foam plants” that froze after oozing their foam. I’ve never heard of them, but they were everywhere. 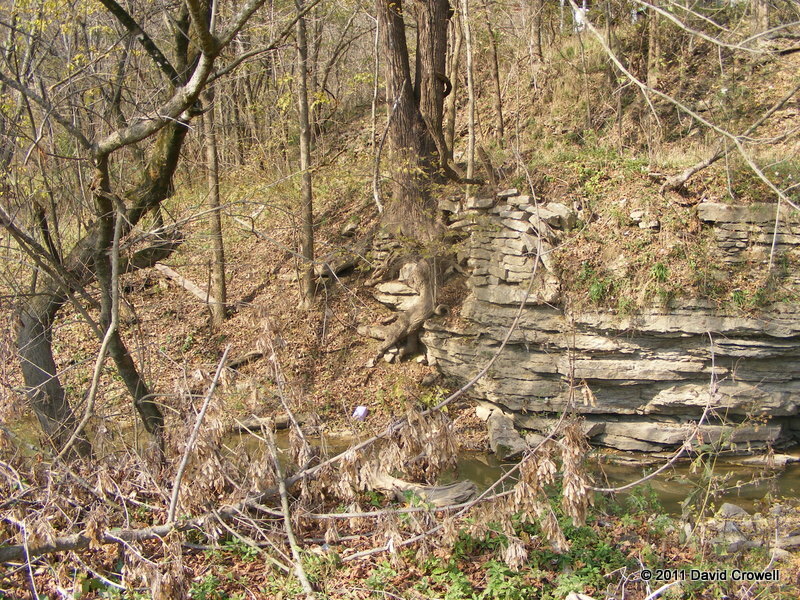 Flat Rock Rd was a pleasant downhill run into a creek valley, but at 5.5 miles into the ride we came a a creek crossing with two problems. 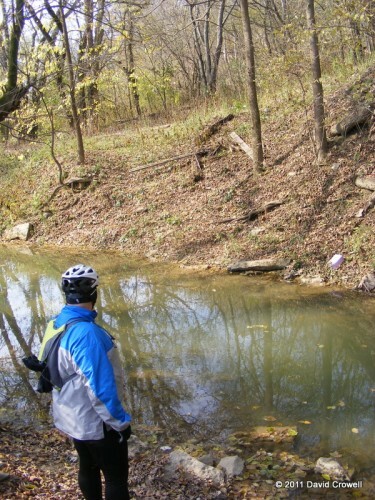 1) The creek was deep enough that riding through or walking was not possible without getting wet. 2) We couldn’t see where it crossed to. We figured that once across somehow, that we’d pick up the road somewhere. We walked up and down the bank looking for a good location for crossing. It didn’t exist. Tim and Timothy began throwing stones in a shallow but fast-moving section to try to build a bridge. It would have taken a lot of stones and time to make it where we could simply walk across and stay dry. It quickly became apparent we’d just need to walk through the water. With the cold temperatures, it was best to do this barefoot. Timothy went first. Timothy left his bike behind, know we could pass it to him. I wanted mine with me to hold on to if I started to slip. I didn’t slip, but I did submerge by bike deeper than planned. It’ll need a new bottom bracket and the hubs re-packed soon. I was too busy helping move bikes and cursing at cold feet to get a picture of Tim crossing, but he did the same as us. Once across, we all sat warming and drying our feet as much as possible before putting shoes and socks back on. Timothy had brought a towel and was drying his feet with it. Luxiourious! Once we again had our footwear on, we started looking around for the “road”. This “road” is marked as such by the county maps that Tim uses for these excursions, and normal web-based maps aren’t accurate enough. 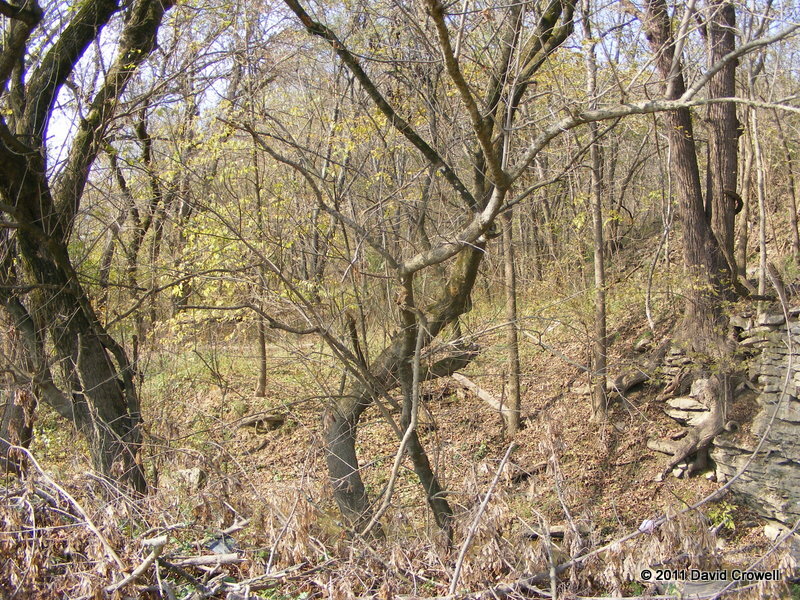 We eventually found signs of an old road bed that had been long-abandoned. It also “shared space” with a tributary of the creek we crossed earlier. Undeterred we followed along, following the happy purple line on my GPS. 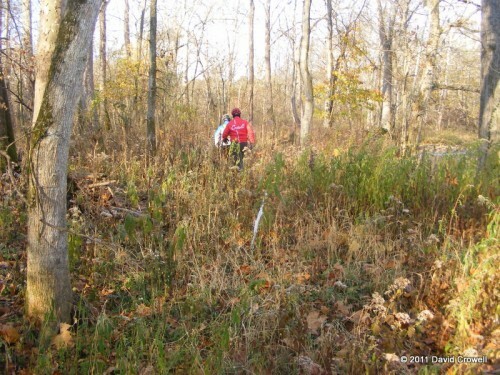 After leaving the creek bed we still had to walk our bikes due to the poor condition of the old road bed. 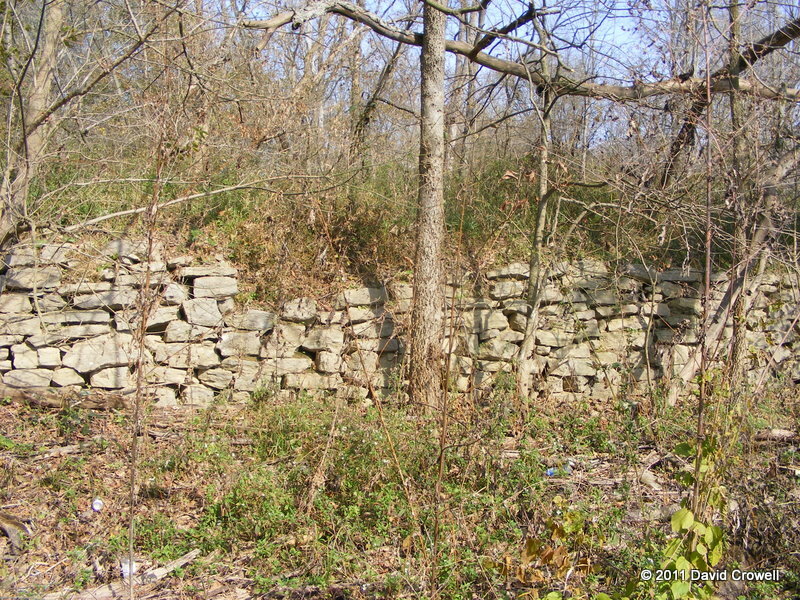 Eventually after a small climb, we were dumped back on Denner Ln where it “dead-ends” into somebody’s driveway. … and away we go…. Before long we were on paved roads again. I was trying to keep up, but I had no energy and kept falling behind. I was really beginning to hate the ride. I was questioning my ability to ride it, and the Gravel Grovel. I was in a foul mood, and I really wanted to just take the most direct route back to my truck. This turned into self-loathing because I know that part of the problem is my recent weight gain. Part of it is that I don’t do long rides as often as I used to. Most of my mileage is around town these days. The third cause was the real one. I hadn’t eaten enough. On was on the verge of “bonking”. I stopped to eat my extra scone and drank some water. I still needed more. 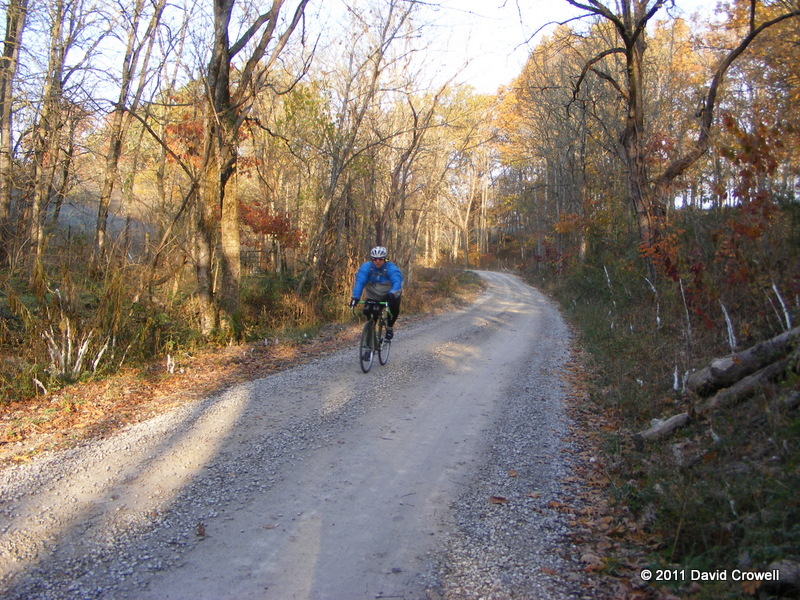 We turned on Joe’s Branch Rd, a rather pleasant downhill gravel stretch. My speed was limited due to sketchy roads conditions but it was fun. Tim struggled more here with his narrower tires. 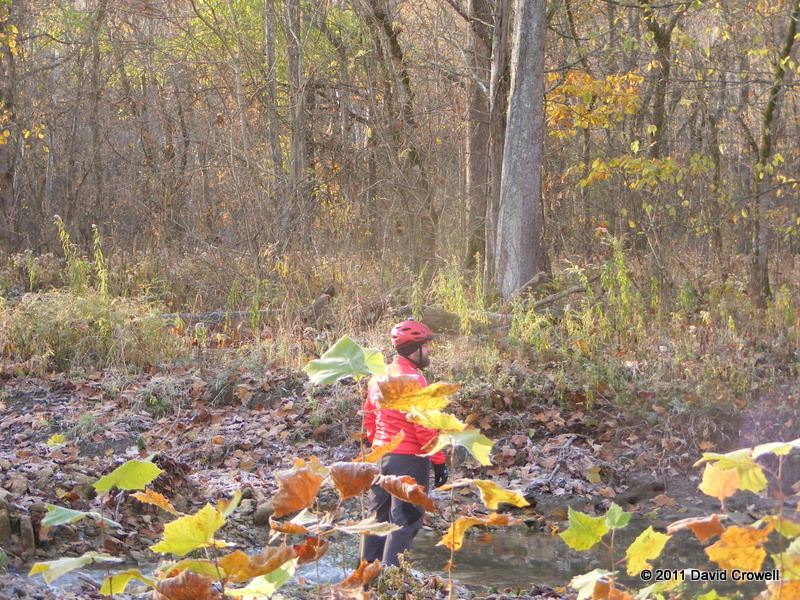 There were several mostly dry creek crossings, but they paved those short stretches. We turned on Sixmile Creek Rd, which was probably the best road I’ve ever ridden. It runs along a creek valley floor, so it’s not too hilly. It was rugged, but varied enough that it wasn’t just a long slog over rough gravel. It’s unfortunate that I was still feeling horrible and wanted to quite the ride. Sixmile Creek Rd goes into Lockport, a tiny little town on the Kentucky River. Lockport had nowhere open to buy food on a Sunday morning, but they did have dueling churches across the street from one another. One was Baptist, the other Methodist. The next town would be Gratz. I had hopes for food here, as I had done a little research ahead of time. 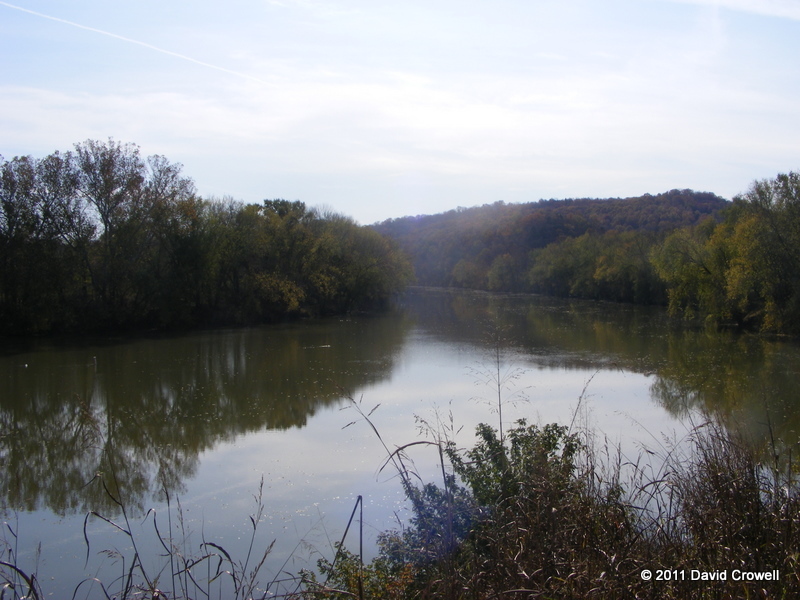 389 had some nice views of the Kentucky River. The stopping for pictures helped me feel better, but I was still dragging. 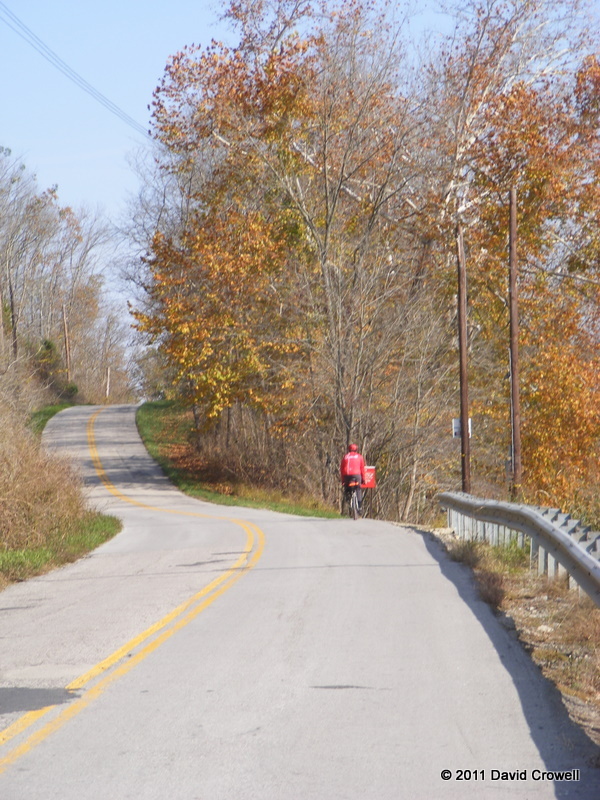 As we approached Gratz, we realized that Hwy 22 has been re-routed to a new bridge over the Kentucky River into town. The store stop I researched (but never called) doesn’t seem to exist anymore. There was a restaurant, but they’re closed on Sundays and Wednesdays. No food in Gratz. Monterey is the farthest point of the ride. Surely there is food there! The trip to Monterey was on Hwy 355 for much of the way. 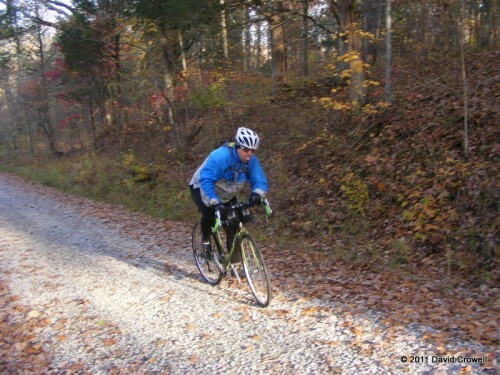 I fell behind (again) and came to a turn we supposed to make at Severn Creek Rd, a nice gravel road. I was pretty sure that Tim and Timothy had not gone that way, but I wasn’t positive. I stopped and waited a few. I tried calling Tim. I sent him a text message. Nothing. I continued on Hwy 355, ignoring the turn. That was the right choice, they were both heading back toward me on 355, wondering where I had went. I mentioned the turn, and it turns out that they had discovered last night that that road does not go through, and modified the route to stay on 355. Unfortunately, that was after I loaded the route into my GPS. We continued to Monterey, and there was nothing in town. We stopped and asked a guy who was outside, and he gave a directions to “the store”. 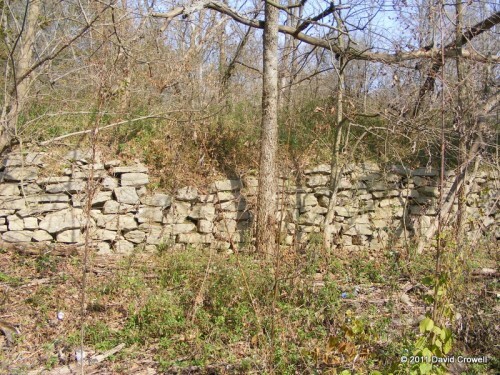 It was south-east of town on Hwy 127. Nice wide shoulders made this busy road easy to ride on. There was indeed a gas station/convenience store that sold burgers, hot dogs, and pizza, along with the usual fair. We took our time. I had Gatorade, a burger, chips, and bought several oatmeal creme pies for later. 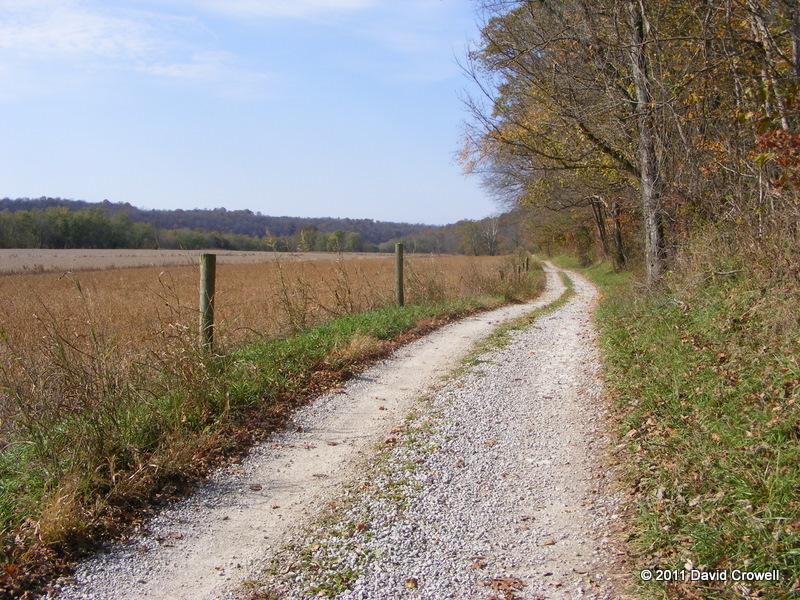 We went back into Monterey, and started looking for Old Landing Rd, that promised to be gravel. We found some two-track off of High St that looked like it was going the right direction. It was rutted dirt, mud, and sometimes grass. 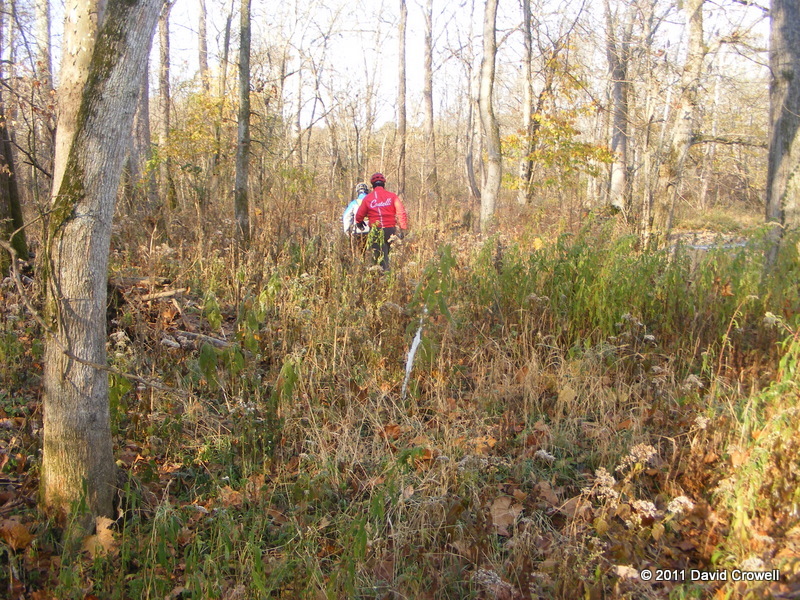 We kept following it even as we could see on the GPS that we were deviating from our desired direction. 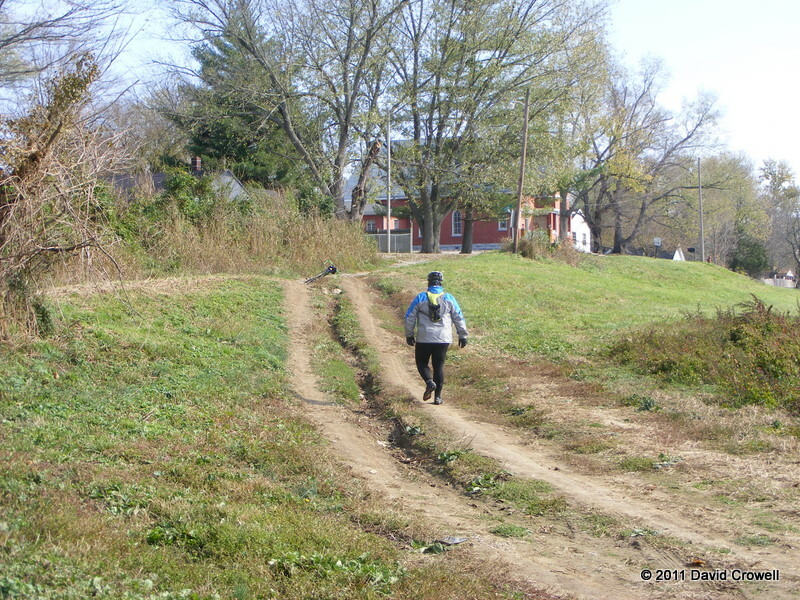 Eventually our “path” came to a dead-end at the Kentucky River. We turned around, I was at the tail-end of the group. 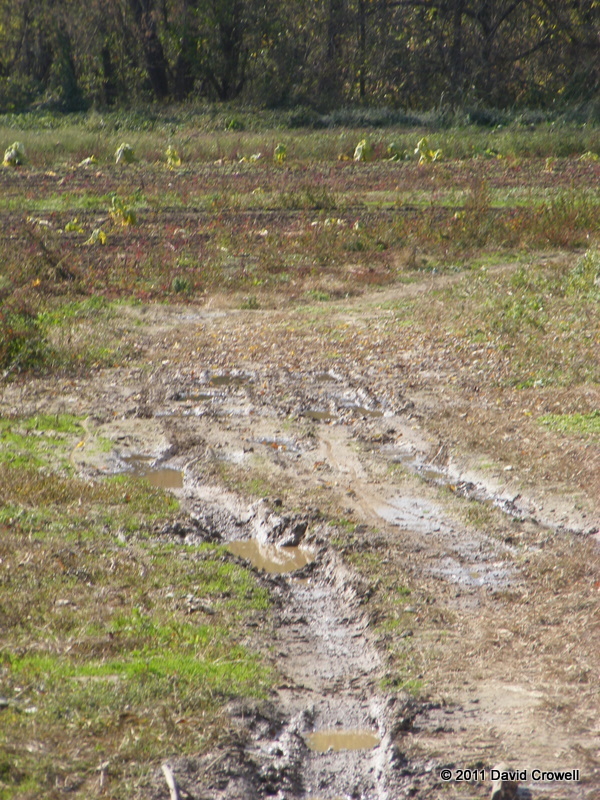 I saw the soupy mud up ahead, and I decided to charge through it rather than risk bogging down. Instead I fell. I banged my shoulder and tweaked my neck, but luckily mud is soft. I did get rather dirty. 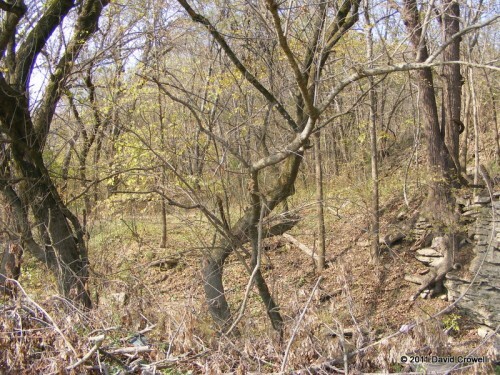 While making our way back, Tim noticed and old roadbed and the remnants of an old bridge over another creek. Was this our road? It was neat to see, but there wasn’t anything rideable on the other side of the creek. We didn’t want to hike through this. We sat around a bit getting our bearings. Heading back to the bikes. Looking back where I fell. We went back into town and tried another street… and found an easy turn on Old Landing Rd. The old roadbed that we had been looking at used to be part of it, but it’s been re-routed a bit. Our dead-end jaunt while looking for the road was actually very close to it. We didn’t see it because it was up higher than we were. Old Landing Rd was a gravel road that runs along farmland and the Kentucky River. It was a really nice ride. Along this point I started feeling much better. The food was doing it’s magic. The temperature was warming substantially too and I needed to lose a couple of layers. I’m used to riding a bike with a rear rack and usually have at least a trunk bag, and sometimes a pannier or two. I didn’t really have a place to put clothes that I removed since I was only carrying the handlebar bag. Timothy found a bungie cord along the side of the road. I put my jacket and sweater on top the handlebar bag and used the bungie to hold everything in place. It worked well enough. Now that my food issue was solved, Timothy started having bike issues. His bike wasn’t shifting properly, and he had to replace a bent link in the chain. 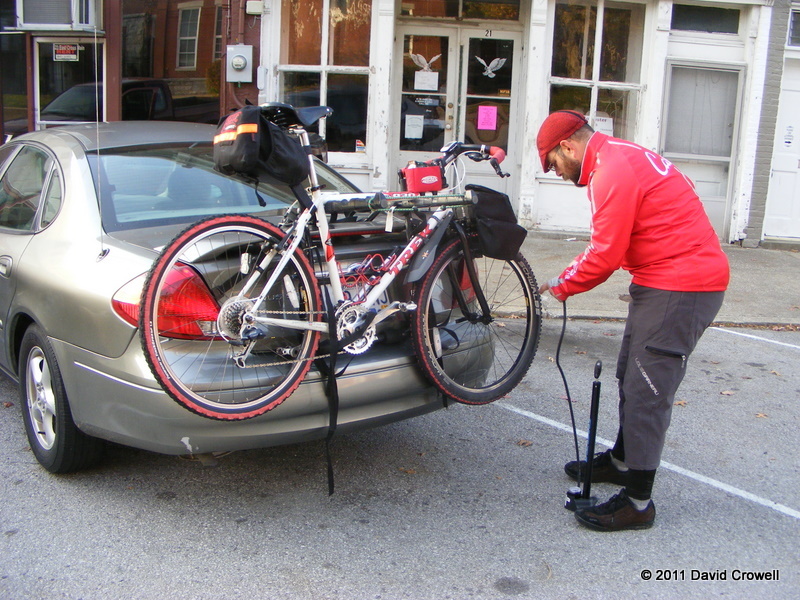 He had a low rear tire, gave it a quick pump, and as we rolled into Lockport on the return trip, he stopped to replace the tube. This worked well, as the store that had been closed was now open. I went in for more Gatorade and oatmeal creme pies (yeah, I know, bad food). It was an interesting store. There were at least three friendly dogs in the store. They seemed well behaved. 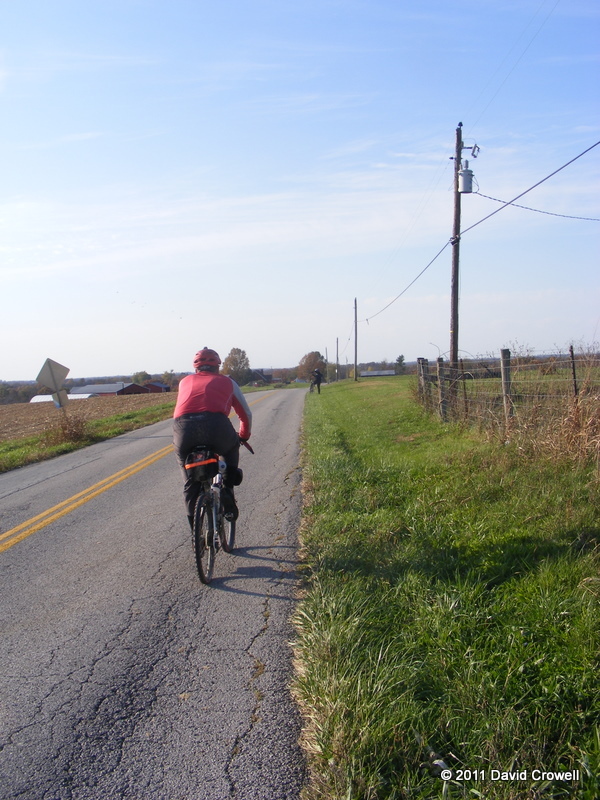 After leaving Lockport, we got to ride the wonderful stretch of Sixmile Creek Rd again. Very nice. We also took another section of it south that was also quite nice to get down to Hwy 573 then directly back to New Castle. No more hiking through the woods for the day. I still wasn’t going fast, I’m not a fast rider. I was feeling better and not bitching much at this point. Timothy, who’s a stronger ride, was falling back. 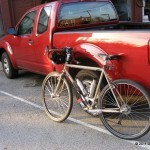 Although he’s used to longer (mileage) rides, he’s not used to being in the saddle for 8+ hours for a sixty mile ride. I would assume the cold-water crossing is new to him too. Tim was in the lead, until almost at the ride finish, when Timothy poured on the speed. I didn’t try to catch up. Tim managed to pull ahead again, leaving Timothy behind. Timothy and I arrived in New Castle together with Tim waiting for us. This is training for a race. Today’s time would have been a disqualification. 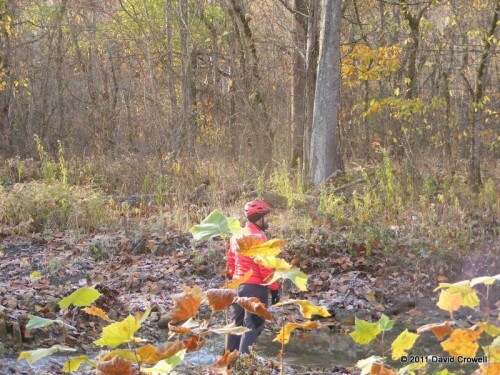 Then again, the race is not likely going to require me to take off my shoes or hike through woods without as much as a trail. According to our bike computers and GPSs, we spent almost three hours STOPPED. Keeping moving is important. I need another bag on the bike. 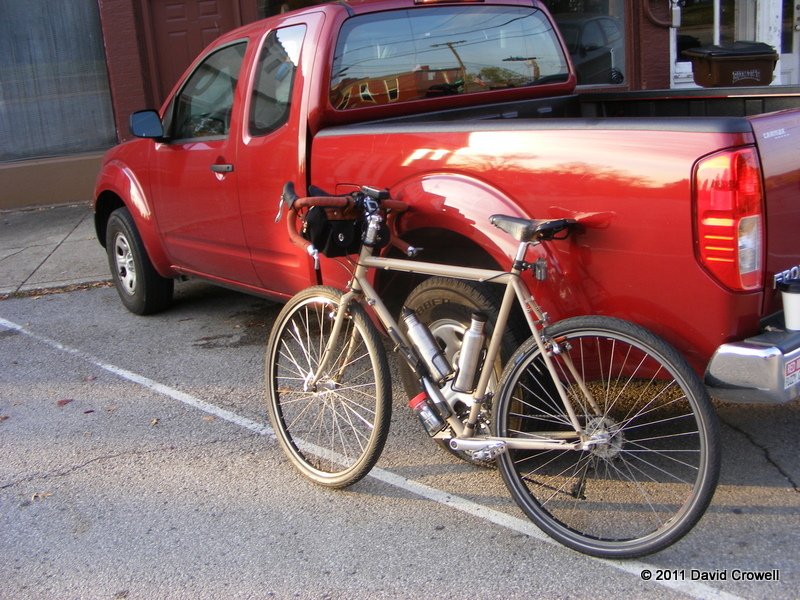 I’ll probably just throw the rear rack back on and use the truck bag. I don’t want to spend the money for a large saddlebag. I’m not convinced I’ll do anything like this next year. I like stopping for pictures, food, or just to take a break. I don’t know that the GO GO GO type riding is really my style. I’ll do it for this training, and the race itself, but after that, I’ll have to put some real thought into it. Wow, that’s quite an adventure. With my work schedule lately, I’m finding regaining fitness to be a challenge. That means training for some kind of race is not practical. Fortunately, I’ve got that annual gravel ride I host in December coming up. The Ramble is designed for riding at conversation pace, stopping for snacks and photos, and enjoying the countryside. 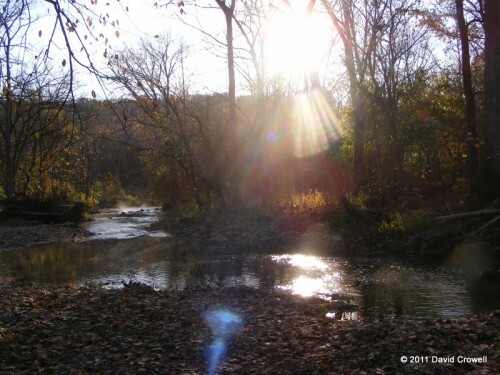 If the Gravel Grovel turns out to be not your thing, the Ramble might be a suitable alternative. The roads were pretty epic. Several of them would take a Jeep to get through. The Awards ceremony for the Grovel starts 6.5 hours after go time. the course closes at 8 hours. If we keep our stopped time to a minimum, the awards ceremony should be possible. I doubt the roads will be a torturous as the ones we were on that day, but more likely similar to the ones we road in Indiana. For the roads in Indiana, Beast was a bit overkill, as Tim was faster than me all day, but for the chunky stuff on this day, it was more in its element. That was quite the adventure, David. Thanks for sharing it, especially the pictures. My family’s all from Owen county originally. The stone restaurant (which I’m sure was closed on a Sunday) in Monterrey used to belong to my grandma, and her mom before that. As a kid, I used to deliver drinks to the tables to earn “tips” to feed the jukebox and my addiction to rocky road ice cream. 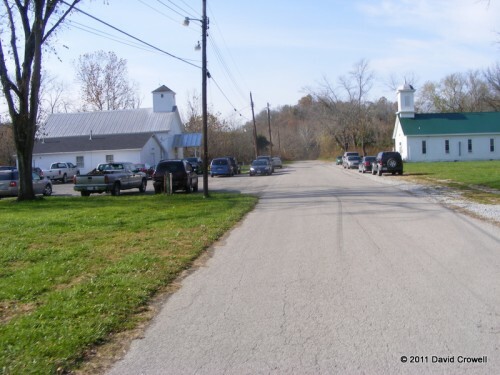 Also, I’m pretty sure that the red brick Baptist church visible in the “Tim walking back to his bike” photo is where I was baptized as a kid and spent a lot of summers attending VBS. My uncle and my cousin were each mayor at some point. It’s extremely pretty there, with the rock walls and creeks and woods, but the entire town is in the flood plain for the Kentucky, and all the homes are uninsurable, since it’s a virtual certainty they’ll flood about every 10 years. It’s a shame because it’s a really pretty town with a lot of history. In the turn of the last century, the locks on the Kentucky River made it a booming river town. But most of the people there accept that at some point, the town will probably cease to exist as fewer houses get rebuilt after the 10 year floods. One more centennial flood will probably be the end of it. Awesome job. Don’t be discouraged as that seems like a very difficult ride in tiugh conditions.